As I reflected on this Sunday’s Gospel about the healing of the Man Born Blind. I noticed the one thing that I kept returning to. It was "why" the Jews did not believe that he had been healed by Jesus and blind since birth and then they even questioned his parents. The Jews were still not satisfied, they questioned him a second time. However, during this time of questioning he became very frustrated and answered them by saying, "One thing I do know, that though I was blind, now I see!" After reading that part of the narrative about the disagreement and conflict of the healing, all that kept going through my mind without ceasing was the words from the familiar song "Amazing Grace." "One thing I do know, that though I was blind, now I see!" Those words played over and over again in my mind. Know that at that point I became very curious about this song. I have to admit I couldn't even remember who the composer was that wrote the Hymn. So, I turned to one of my trusty search engines, to research more information about that famous Hymn, "Amazing Grace." I discovered a very insightful story about the composer. The Hymn was written by John Newton; he was an eighteenth century British slave trader who had a dramatic faith experience during a storm at sea. He gave his life to God, left the slave trade, became a pastor, and wrote hymns. His life's journey led him from disgrace to amazing grace and was transformed from a wretch to a son of God...by God's amazing grace. My reflection took on a whole new revelation after reading the story of Newton's spiritual sight, and the blind man's physical and spiritual sight. John's account of the healing of the man born blind is certainly a sign, for it points to Jesus the Healer and the Light of the World. As I continued to reflect on the story, I seemed to have focused on the importance of seeing, or "spiritual sight." Also, very important is the recognition of Jesus, and the focus on the importance of hearing. The blind man first responds to Jesus' voice. 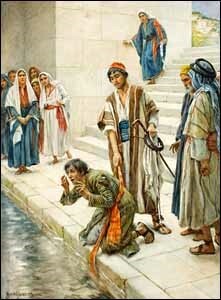 Jesus tells him, "Go, wash in the pool of Siloam," which the blind man does. He hears Jesus before he sees Jesus. The story also reveals his gradual sight, from seeing Jesus as "the man called Jesus" to addressing him as "Lord" and worshipping him. In fact, Jesus himself reveals the importance of both sight and hearing when it comes to belief, Jesus said to him, "You have seen him, and it is he who is speaking to you." How blessed was the man born blind to have met Jesus who offered him comfort, assurance, healing and eternal life. In return, the man who received his physical and spiritual sight, worshipped Jesus, face to face! Wow!